I love this question because of how Rush feels betrayed because I had moved on. But even better, I love this question because I have wondered myself why I use Downcast when I said to use Pocket Casts. The first thing to tell you is that I actually use both! I use Pocket Casts on my iPhone for audio podcasts, and I use Downcast on my iPad for video podcasts. But I still had to go through both apps to try and articulate why I don’t use one podcatcher for both. The origination of my move to Downcast for video shows was that Pocket Casts didn’t support video. In looking at the two apps side by side now to explain my usage, I’ve discovered that Pocket Casts does support video now, so if I was to choose today, what would I pick? The best place to start is to set up our requirements. Sort of like problems to be solved, right? I do have different requirements depending on the device. For example, on iPad I want the easiest way to fast forward and reverse. I often miss something and want to hear it again so a quick backward swipe on screen is a delightful gesture. On iPhone I want to be able to set up playlists so I can queue up a series of short audio shows for a long run, or maybe a series of long shows for a long drive. Several of the audio and video shows to which I subscribe have very long preroll intros and ads. I’d like the option to have the shows start at a prescribed time in, but it’s different for each show. The ad lengths in the shows can be very long too, so the time fast forwarded upon a gesture might need to be very long on particular shows. I’m pretty sure you can guess what shows I’m talking about. I know a lot of people favor Overcast. One of the main features that caught people’s attention is the way it will clip out silence. There are some shows where the speakers may leave a long pause from time to time. Removing the silence can make it more enjoyable and get you through a show faster. I’ve asked people who like this feature whether they gain time on the NosillaCast but the answer is always, “not much!” I’m proud of that. If this trim silence thing is a feature you like, we’ll add it to the list. I also really like to be able to have auto-download and auto-cleanup options in my podcatchers. Some shows I like to keep around “just in case” so keeping the last couple of shows downloaded is handy. There’s also a list of nice-to-haves, not really requirements. I’d like to have an easy and intuitive way to clean up podcast subscriptions. By that I mean the ability to delete entire podcasts when I bore of them. So let’s look at Pocket Casts and Downcast against these criteria. When I got this question from Rush, I figured I’d better put Pocket Casts on my iPad and start testing it so I’d know how it worked. I downloaded a video podcast, and when I hit play, I only got audio. I assumed I downloaded the wrong feed, so I deleted the show and found it again. Still no video. Turns out by default when you hit play, Pocket Casts only plays the audio, but if you tap on the progress bar at the bottom, it pops up the video. Sorry, but that’s weird. Downcast is really designed for video playback. Its biggest strengths are a double tap on screen pauses the video, a swipe left rewinds, and a swipe right jumps forward. Steve and I use this all the time. You can have your hands soapy from doing dishes and still use your knuckle to pause and make a comment about the show or jump back to listen again to a bit you missed. This swipe gesture is so important to me that when Don McAllister came out with an awesome dedicated app just for ScreenCasts Online, I told him I liked it but probably would go back to Downcast because of the swipe gestures. Don got the same feedback from others, and these swipe gestures were added in the next version of the ScreenCasts Online app. Sadly Pocket Casts doesn’t have any swipe gestures that I can find. Downcast has global controls for many things, including how far into shows to start playing. In each podcast you can override the global setting. I absolutely do this on many shows from certain podcasters. On one of them, starting 2 minutes in leaves plenty of time to hear the tail end of the pre-roll ads. Speaking of global controls, Downcast also lets you globally set how many episodes to keep and you can override this setting for specific podcasts as desired. Pocket Casts will also let you define a specific start time for each podcast, but doesn’t appear to have global settings for this feature. I’m cautious by saying “doesn’t appear to have” rather than “doesn’t have” because so many controls are not easily discoverable in Pocket Casts. When I first started using Pocket Casts, it had the concept of playlists, but a while back they got rid of playlists. I wrote to the developer explaining how crucial they are and they explained that they’d just changed to the concept of Up Next. It took the dev to walk me through how to use Up Next, which shows that even if the concept is good, the UI isn’t transparent to the user. Let’s say you want to listen to the rest of the NosillaCast, and when it’s done you want to listen to Chit Chat Across the Pond. On iPhone, you see the currently playing show at the bottom of the screen, regardless of where you are in the navigation of the Pocket Casts app. To get to Up Next, you swipe from right to left along the bottom. At first you’ll see “Your Up Next is empty”. Now you navigate to another show (or the same show) and instead of play or download buttons next to the episodes, you’ll see Plus buttons with Up Next under them. Tapping a plus button adds it to that bottom bar for Up Next. 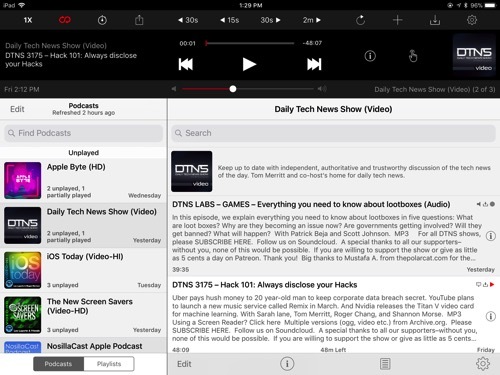 You can also add to Up Next by opening an episode and tapping the icon with 4 horizontal lines and a check mark. But you still have to find Up Next to manage what you’ve put in there. Deleting from the Up Next is accomplished by tapping and holding on an item in that bottom bar, and dragging the item onto the x symbol that shows up on screen. You can also press and hold and drag the icons around to reorder them. It works but never in a million years would I have ever figured this out on my own. Not sure what was wrong with playlists anyway. Up Next on iPad is completely different. You can use that icon with the checkmark to add to Up Next, but there’s no little slider bar at the bottom with icons. Instead, a little list button in the bottom right reveals Up Next and allows you to edit the list. After discovering this on iPad, I discovered that on iPhone with an episode playing you can swipe from right to left and reveal the Up Next list and reorder or delete episodes there too. As much as I find Pocket Casts Up Next feature unintuitive, now that I’ve mastered it, it works. In contrast, I don’t like Downcast’s playlist feature at all. Maybe I’m a control freak but I want to configure my playlists with specific episodes in specific order, picking and choosing between podcast series. With Downcast, the only control I can find is to choose episode by whether they’ve been played, how to sort them, and group by podcast. Pretty much unusable. This pretty much eliminates Downcast for me as an audio podcatcher for exercise or driving. Both apps allow you to change playback speed, but only Pocket Casts has that great feature of Overcast that lets you trim silence. I dare you to find it though. I found it when researching this “dumb question” but I spent a lot of time trying to find it a second time, and eventually had to resort to the Googles. Here’s how you find Trim Silence. Start playing an audio podcast in Pocket Casts. Then tap on the album artwork to bring up what they call the mini player. Look with a keen eye for an icon that looks like an old-fashioned radio dial, or a dial you’d see on an analog mixer. It’s a circle with four hash marks around the outside and one hash mark inside the circle. I thought it was a sleep timer and missed it entirely. Anyway, if you find the secret icon you’ll be able to change playback speed, trim silence and even enable volume boost. Pocket Casts wins for capability but loses for discoverability of these capabilities. I didn’t mention it in my requirements but we’ve talked a lot about the desire for chapters to be viewable in podcasts. In Downcast there’s a little bookmark symbol, and tapping on that in all versions of Downcast reveals the chapters in a podcast. On the timeline, you’ll see little tick marks indicating chapter marks. The fast forward and back icons have vertical lines on them, which means you can use them to jump from chapter to chapter. As is beginning to be a pattern, I had to go to Google to figure out how to view chapters in Pocket Casts. It’s in there, but I sure couldn’t find it! When playing an episode in full-screen mode, if there are chapters in the show the name of the chapter you’re on will be right under the artwork. If you tap on that chapter name, it will bring up the chapter list. Again, why do they make this so hard? Pocket Casts doesn’t even show tick marks on the timeline to tell you there are chapters, and the fast forward and back icons don’t allow you to jump to the next or previous chapter. Downcast also wins in the ease with which you can unsubscribe from a podcast. In the list view of shows, simply swipe left and tap on the red delete button just like we’ve been taught in every app starting with Apple Mail. Pocket Casts has made it so much harder than it needs to be. In list or icon view, you have to open the podcast, tap on three dots in the upper right, choose unsubscribe and then confirm with a tap of unsubscribe. This isn’t something I do often so every time I do want to unsubscribe from something, it takes me ages to find it again. In Pocket Casts, I really like that I can drag the show icons around on the grid view and put my favorite shows at the top. They have very visible badges on the icons of unplayed or partially played shows so it’s easy to jump into the ones I want to hear. Downcast allows you to sort by title, playlist priority, publication date or unplayed episodes. None of these are what I want, unfortunately. The podcasts have tiny text under them in a list view saying how many unplayed episodes, but it doesn’t jump out at me like the nice red badges on Pocket Casts. I always like to swing through apps with VoiceOver turned on to see if everyone can play. As always my skills with VoiceOver aren’t professional grade, but I can usually tell if the effort has been put in to label buttons and make text accessible. Downcast appears to be 100% accessible via VoiceOver. I found no unlabeled buttons in my cursory passthrough, looking at settings and playback features. Pocket Casts was ok, but not great for accessibility. On iPhone, once you go into play on an episode, you pretty much have no controls other than to pause. At least I couldn’t figure out how to get to other controls. On iPad Pocket Casts has more controls, but for some reason, the play/pause button is inexplicably unlabeled. The skip back button’s default is 10 seconds, so VoiceOver simply says “10 button” and jump ahead is 45 seconds so you hear “45 button”. If you know that, it’s pretty easy to surmise that the button between them is play/pause. But if you don’t know that, it would be a matter of trial and error till you figure it out. One comical thing is how Pocket Casts reads out the length of podcast episodes. In some places the time is written with a number followed immediately by an “m” for minutes, so Pocket Casts reads it out as 32 meters. Another thing you can get past, but not ideal. Overall Downcast wins hands down for accessibility. I don’t want you to think that this was an exhaustive list of everything these two podcatchers can do. They both have tons of features that I either don’t use at all or that are not important to me. The good news is that we have some great podcatchers from which to choose. 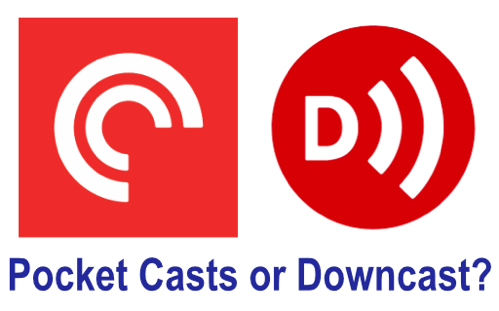 I have to say though that after walking through each of the features to write this up, I realized that there’s an awful lot I prefer about Downcast over Pocket Casts. I’m going to try moving over to Downcast for as my audio podcatcher of choice. I’m not sure I’ll stick with it because when all is said and done, finding something to listen to and hit play is the most important feature, and I think Pocket Casts might do that better for me. We’ll see! Thanks again to Rush for his video Dumb Question!